We have been lucky to find the best HTC One M9 cases that can give your device more protections and stylish. The HTC One M9 is a 2014 flagship device from HTC that shipped with a Qualcomm Snapdragon 810, 3GB of DDR4 RAM, MicroSD slot and 20 MegaPixel of the rear camera. It has a metal body that looks premium and great feel when you hand on it. To keep your HTC One M9 last for long use and can protect from serious drops, scratches, and any damages, you will definitely need protection from a case. To start with, this is the best protection with an ultra slim fit case design from SUPCASE. It’s only 0.8 ounces so it will not add more extra weight for your phone. With the front raised edges of the screen can protect your device when you face down. This SUPCASE SoftGel Flexible TPU Case made of high-grade TPU combined with advanced coating technology to protect your device against scratches, scrapes, slip, and other damages. Every feature including camera, buttons, and ports are all still accessible when you installed this case. Here is another case from Supcase that made of high-grade soft thermoplastic polyurethane and hard polycarbonate materials for the best protection. This Supcase Unicorn Beetle case has custom buttons allows you to access all buttons while block dust and debris. With perfect cutout for cameras, ports and, special smart clear button, allow you to access all device’s features including IR Blasting. The size of this case is (LWH) 6.5 inches, 3.5 inches, 0.8 inches with the weight of 1.6 ounces. 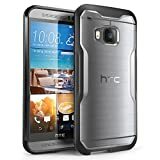 The next one is OtterBox Defender series case for HTC One M9 that features the three layers of rugged protection. The OtterBox is a leading company in making multi-layer cases that provide great protection against dust, debris, drop, scratches, scrapes, and shock. This multi-layer case made from high-quality materials. The exterior of the case using a durable synthetic rubber slip cover for absorbing impact. While other two layers (inner shell) can deflect bumps and shock with polycarbonate material. It also included a built-in screen protector that can protect your device’s touchscreen from scratches and scrapes. The size of this case is (LWH) 4.2 inches, 1.7 inches, 7.5 inches with the weight of 3 ounces. 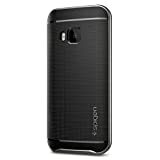 The next one is the case from Spigen that can provide protection with a combination of PC bumper and outer TPU shell design for your HTC One M9. It also has front 1.2mm raised edges of the screen can protect your device when you face down. This Spigen Neo Hybrid case also features metalized custom buttons for an easy, responsive, and fluid press. The size of this case is (LWH) 3.8 inches, 1 inch, 7 inches. 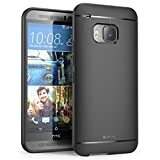 This is an official case from HTC company that made specifically for the HTC One M9. The best thing about this case is unique functionalities that others don’t have. This case allows you to get instant notifications, weather updates, and caller ID even while the case closed. This case also extends the gesture feature of your HTC One M9. The size of this case is (LWH) 7.2 inches, 4 inches, 0.8 inches with the weight of 2.7 ounces. Those are the top cases that can provide the best protection with a stylish design for your HTC One M9. If you want a light-weight and a stylish design, you would probably choose an Ultra Case case from SUPCase. For the best protection, the cases from OtterBox and Supcase seems to be a great choice. While the HTC One Dot View II allows you to access special live notification and gesture feature even the case closed.